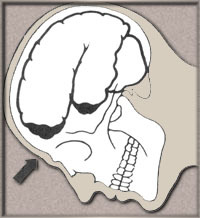 Internal forces which cause brain injury within the skull, as opposed to the head impacting an external object, occurs when the brain hits the inside of the skull. Internal impact can occur without a blow or contact to the head. For example the acceleration/deceleration of the brain will be much greater with external contact, the brain damage is likely to be more severe in such case. A good example of internal force is “Shaken Baby Syndrome”. Even though there isn’t any sign of trauma externally, the shaking of a baby as an internal force can cause severe brain damage or even death. When a baby is “shaken” it can cause such extreme internal force that can result in a subdural hematoma which is also known as bleeding in the brain. Shaking a baby may also increase the intercranial pressure which may also cause brain injury. This may be considered one of the most common internal forces which cause brain injury within children. Unfortunately also one of the saddest. 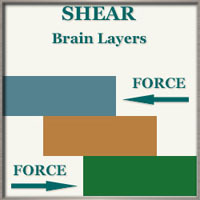 The brain is made up of many different layers or lobes, each which has a different density. Axons are long, thin neuronal fibers that criss-cross these layers. When tsubjected to acceleration/deceleration forces (even in whiplash), especially when such forces are centrifugal (rotational) in nature, the different layers are torqued at different speeds. This torque of these fibers can cause shearing. Shear is the most likely mechanism of injury in an automobile accident, because of the rapid deceleration of the automobile in the crash.